The evolutionarily conserved serine/threonine protein kinase target of rapamycin (TOR) is a master controller of cell growth. TOR controls growth by promoting anabolic processes and inhibiting catabolic processes in response to nutrient availability, growth factors and cellular energy, which can be perturbed by environmental and cellular stresses. These upstream signals are integrated by TOR, which in turn modulates protein synthesis—an energetically demanding cellular process that requires tight regulation to minimize energy expenditure. The TOR pathway plays a central role in the control of protein synthesis through the phosphorylation of numerous substrates with well-characterized functions in ribosome biogenesis and the initiation and elongation steps of protein synthesis. The role of TOR in protein synthesis has been studied in extensive detail in several eukaryotic model systems, and consequently, a great deal is now known about how TOR controls protein synthesis in eukaryotes. 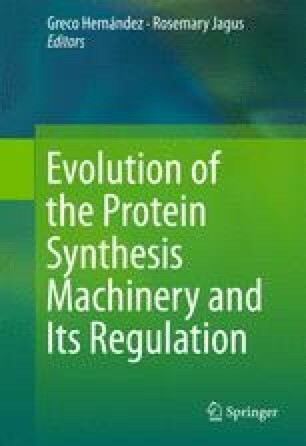 In this book chapter, we provide an evolutionary perspective of the TOR pathway in the control of protein synthesis and ribosome biogenesis across eukaryotes (from unicellular to multicellular organisms). We wish to thank all of the scientists in the TOR field for their contributions to our present understanding of the TOR pathway. We apologize to the scientists whose work was not acknowledged or discussed in further detail, in particular those who have contributed to the elucidation of the signaling pathways up- and downstream of TOR that regulate cellular functions other than mRNA translation. The authors wish to thank the various funding agencies that have contributed to research in our laboratories over the many years of the study of TOR. The authors also wish to thank the following funding agencies that currently fund their research: A.G. and M.N.H. acknowledge support from the Louis Jeantet Foundation, the Swiss National Science Foundation and the Canton of Basel. B.D.F. and T.A. gratefully acknowledge financial support from Prostate Cancer Canada. The laboratories of C.M. and C.R. are supported by ANR grants TRANSLATOR and DECORATOR; CR is also supported by the A*MIDEX project (no. ANR-11-IDEX-0001-02).